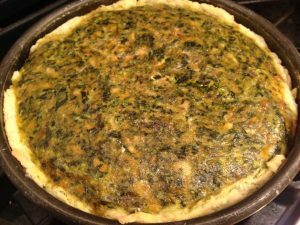 This spinach quiche comes from 14th C. France, where it was included in a book instructing housewives how to maintain their residence and carry out their wifely duties. While the marital advice is no longer relevant, many of the recipes are still quite useful. Le Menagier de Paris, anonymous, c. 1393. Pour faire une tourte. Prenez quatre pongnées de bettes, deux poignées de percil, une pongnée de cerfueil, un brain de fanoil et deux pongnées d’espinoches, et les eslisez et lavez en eaue froide, puis hachiez bien menu; puis broyez de deux paires de frommages, c’est assavoir du mol et du moïen, puis mettez des oeufs avec ce, moyeu et aubun, et les broyez parmi le frommage; puis mettez les herbes dedans le mortier et broyez tout ensemble, et aussi mettez de la pouldre fine. Ou en lieu de ce aiez premièrement broyé ou mortier deux cloches de gingembre, et sur ce broyez vos frommages, oeufs et herbes, et puis gettez du vieil frommage de presse ou autre gratuisé dessus celles herbes, et portez au four, et puis faites une tartre et la mengez chaude. To Make a Tart, take four handfuls of beets, two handfuls of parsley, an handful of chervil, a sprig of fennel and two handfuls of spinach, and pick them over and wash them in cold water, then cut them up very small; then bray with two sorts of cheese, to wit a hard and a medium, and then add eggs thereto, yolks and whites, and bray them in with the cheese; then put the herbs into the mortar and bray all together and also put therein some fine powder. Or instead of this have ready brayed in the mortar two heads of ginger and onto this bray your cheese, eggs and herbs and then cast aged cheese scraped and grated onto the herbs, and take it to the oven, and then you’ve made a tart and eat it hot. Filling: a large bunch of chard, a small bunch of parsley, a small bunch of spinach, a few sprigs of tarragon, ¾ lb cheese (I used ½ lb edam and ¼ lb pave vechio), 3 Tbsp. goat cheese, 6 eggs, 1 tsp. spices (cinnamon, ginger, nutmeg). Wash the greens, chop them, and briefly steam to wilt.